Maintaining your Salon is a very important part of running your business. Moda offers a reliable support team to keep your Salon up and running. Some companies may promise the earth but the only thing they deliver is a hefty invoice at the end of the month. Our customers can relax in the knowledge that repairs, installations and maintenance will not only be quick, but reliable too. And unlike many others, Moda Salon Interiors does not charge a call-out fee, just a reasonable hourly rate. With every Service and/or Sales call you will receive a free health check on the rest of the equipment within your salon. * terms and conditions apply. For more information email or call us now on 0800 999 6446. To book a service visit call us or visit our Takara Belmont Parts Shop. Moda also offers a furniture installation service with installers and engineers trained directly by our furniture manufacturers and with over 30 years experience combined. We can help install mirrors, washunits and cabinetry. All our installers undergo regular product training to keep up with all the latest developments. 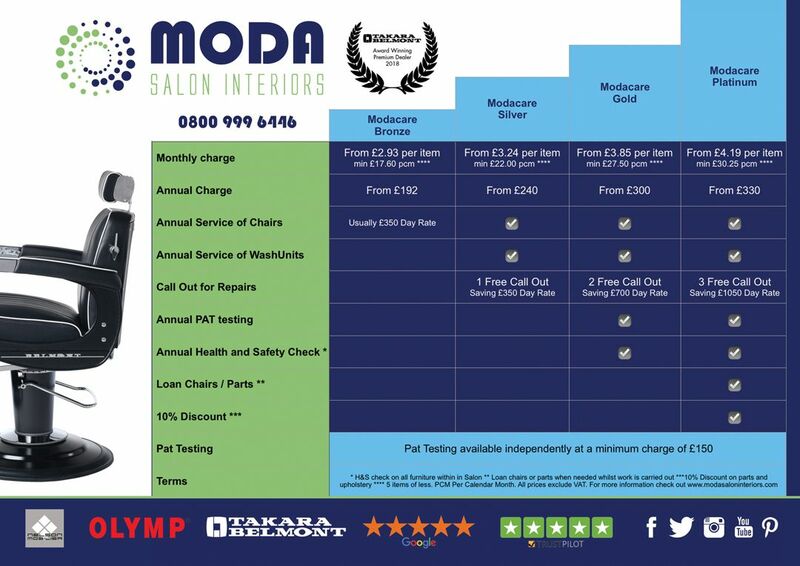 Moda Salon Interiors does not charge a call-out fee, just a reasonable hourly rate. We also offer free installation help via email or phone. Flexible help for you or your installer. Moda works closely with Specialist Shopfitters within the Beauty and Hairdressing industry. Shopfitting is a great way of Refitting and Renovating your salon to a high standard and to your exact specifications. Work is finished to a high standard and in a short but intense period of time. This high standard of workmanship comes with project management to organise plumbers, electricians, painter, carpenters and installers which is a great time saver, lowers the stress of a refit and you can’t beat experience. Shop fitting offers a whole range of services including shop fronts, signage, flooring, roller shutters, stud partitioning, suspended ceilings, air conditioning, electrical, plumbing, carpentry, fascias, decoration, furniture installation. For more information email or call us to discuss your requirements or visit shopfitter-uk for additional information.